The DMV will soon open two additional field offices every Saturday from 8 a.m. to 5 p.m., bringing the total to 62 statewide. The San Diego-Clairemont office begins offering weekend hours on September 8 and Woodland starts on September 22, 2018. Behind-the-wheel exams are not offered on Saturday. Appointments are recommended, but not required for Saturday service. Appointments are available for Saturday service and can be scheduled up to 90 days in advance using the DMV’s website or calling 1-800-777-0133. 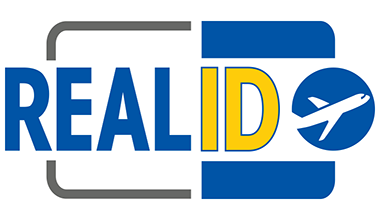 Customers applying for a REAL ID are reminded to visit REALID.dmv.ca.gov to make sure they have the required documents to apply for the federal compliant driver license or identification card. If you choose to apply for a REAL ID, you must visit a DMV field office. To save a step during a field office visit, customers can fill out the new online Electronic Driver License and ID Card application before visiting a DMV field office. Before you renew your driver license or identification card, or apply for one, you must choose between a REAL ID card and a federal non-compliant one. 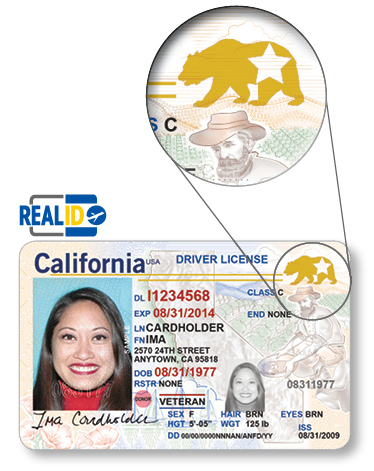 Use our REAL ID infographic (PDF) to help you decide which one is right for you. 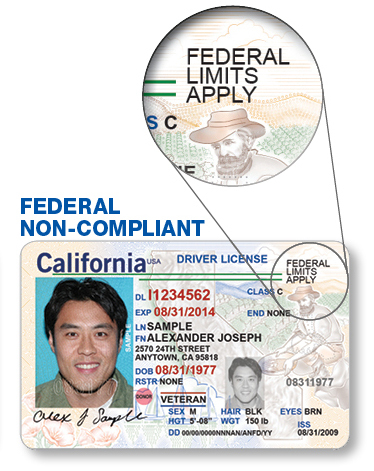 NOTE: Customers applying for or renewing an AB 60 driver license are not eligible to receive a REAL ID driver license. To apply, you must visit a DMV field office and present original or certified documents (no photocopies) proving your identity, Social Security number, and residency (photocopies accepted). Additional original or certified documents are also required if you have changed your legal name. You can renew online or mail (if eligible), without going into a DMV field office. You can NOT use it to board a domestic flight or enter a secure federal facility that requires identification –such as a military base- STARTING October 1, 2020. (You will have to use some other valid identification such as a valid U.S. Passport). This card has the phrase “FEDERAL LIMITS APPLY” on the front of the card. Identity, such as a certified U.S. birth certificate, U.S. passport, permanent resident card, or unexpired foreign passport with valid U.S. visa and approved I-94 form. Social Security number, such as Social Security Card (here’s how to order a replacement one) or W-2 form with full SSN. California residency, such as home utility bill that lists your name and physical address. Pay the application fee: $35 for Driver License or $30 for ID Card. We service all of Westminster and Orange County California. Come visit us today we not only offer the best quality and pricing for traffic school in Westminster, we also provide services such as Passports, Notary Public, Insurance Services, DMV & Passport Renewals. Why wait at the DMV when you can visit us locally we are located off of Bolsa Ave and Dillow Ave in Westminster, California. I got traffic ticket and came here. They help clarify some information for me and show me where to go online for their courses. It was easy. I didn’t get traffic point so my insurance didn’t go up. Thank you. Heather T. – Heather T.
I sold my car without the title and the office advised me to seamlessly transfer the car to my buyer with paperless title transfer. It saved me a lot of time and my buyer received the sticker registration and new license plates right away. I saved 3 hours from standing in line at the DMV. Kristina N. – Kristina N.
I completed traffic school online here about 3 years ago and remembered it to be painless and easy. When my husband needed to complete traffic school, I suggested he do it here. For $19.99, you can do the online class. It is a bunch of reading, a 3 question quiz after each chapter, and a 20 question test at the end that you must score at least 70% on. He was able to complete the whole course in under an hour and scored 100% on all quizzes and the final test. Highly recommend for those comfortable with online learning! Stephanie E. – Stephanie E.